Little, Brown and Company, 9780316451574, 416pp. Parveen, an Afghan-American college senior in search of a calling, feels adrift between the separate pulls of her charismatic and mercurial anthropology professor and the comfortable, if stifling, Afghan community in her Northern California hometown. When she discovers a bestselling book called Mother Afghanistan, a memoir by humanitarian Gideon Crane that has become a bible for American engagement in the Middle East, she is inspired. Galvanized by Crane's experience, Parveen travels to a remote village in the land of her birth to join the work of his charitable foundation. When she arrives, however, Crane's maternity clinic is an empty, unstaffed shadow of the place she'd read about. Meanwhile, the U.S. military has begun construction on a road to the village. As the memoir's fabrications become clear, the reasons for Parveen's pilgrimage crumble beneath her, and when a horrific bombing occurs, she must decide whether her loyalties lie with the villagers she has come to love or the soldiers she has come to respect. 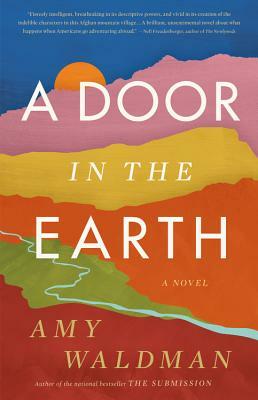 Amy Waldman, who reported from Afghanistan for the New York Times after 9/11, has created a taut, propulsive novel about power, perspective, and idealism that brushes aside the dust of America's longest-standing war to reveal the complicated truths beneath, making A Door in the Earth the rarest of books, one that helps us understand living history through the lives of its poignant and unforgettable characters. Amy Waldman's first novel, The Submission, was a national bestseller, a PEN/Hemingway Award finalist, and the #1 Book of the Year for Entertainment Weekly and Esquire. A former bureau chief for The New York Times and national correspondent for The Atlantic as well as a fellow at the Radcliffe Institute and the American Academy in Berlin, she lives with her family in Brooklyn.